‘The Rise And Fall Of Becky Sharp’ is the latest book by Sarra Manning. This book is Sarra’s modern take on the classic novel, ‘Vanity Fair’. In this book, we meet upcoming socialite Becky Sharp, who after spending years scrimping to get by, is determined to make something of herself. After coming second in ‘Big Brother’, she becomes best friends with winner, Ameilia Sedley. A well known socialite from a rich family, she’s kind with a big heart and doesn’t see when others take her for granted, including Becky. After being cast off to the countryside, Becky reluctantly becomes a nanny to the many children of Sir Pitt Crawley, a former lusted after film star, who has let his house and himself go to rat and ruin much to Becky’s despair. Fortunately Becky meets Rawdon, Sir Pitt’s son and the pair fall madly in love and become one of the UK’s hottest couples, with his upcoming rise to film stardom and Becky becoming the latest reality star, the couple are on the top. As the couple travel the world with the paparazzi watching their every movement, Becky begins to enjoy the life that she feels richly deserves much to the bemusement of those around her. I adored this book, but I knew that would be the case as I love her Sarra’s writing. Her writing is always fresh, witty with fascinating characters and hilarious situations that made for compulsive reading. The book is so reflective of modern life, the pressures of social media and appearance and I thought that Sarra made a fantastic job of adapting the book to the 21st century. I loved Becky, she’s the woman we all dream of being, glamorous, gutsy and not afraid to follow her dreams, no matter the cost. Amelia was also especially sweet and gave an insight into the other side of being a socialite as well as living in Becky’s shadow. 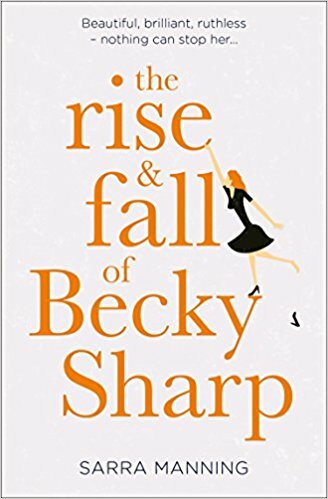 With a fabulous cover, delicious characters, drama and sass throughout, ‘The Rise And Fall Of Becky Sharp’ is a fantastic retelling of a contemporary classic filled with filters, designer labels and wit. You can buy The Rise and Fall of Becky Sharp from Amazon and is available to buy from good bookshops.